Members of St Andrews Table Tennis Club display their skills in some thrilling exchanges. This entry was posted in Match reports, St Andrews Table Tennis Club on April 20, 2017 by standrewstt. 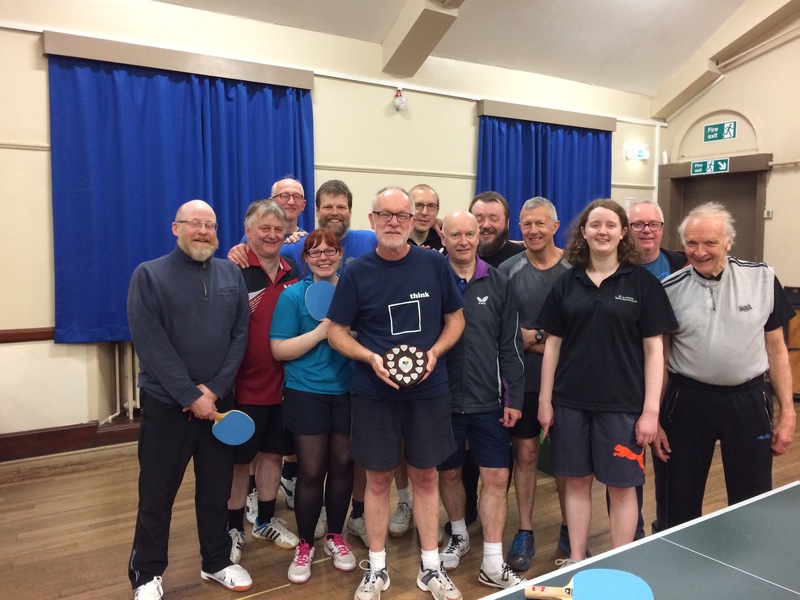 St Andrews Table Tennis Club’s competitive season has drawn to a close with two contrasting events. In the first, local team Prefects reached the heady heights of Dundee & District’s Handicap Cup Final – no mean achievement for a Division One outfit as the handicappers usually lean towards favouring clubs from the lower divisions. Clyde Johnson, Howard Lee and Michael Hahn took to the table against Division Three’s Sputniks from Forthill, knowing that in each match they would have a mountain to climb against very competent players in Sandy Bertie, Dave Hunter and Daniel Russell. At the halfway stage of the tie, honours were even with Michael having scored three points and Clyde two. The following battle between Howard and Dave became too painful for the St Andrews contingent to watch, with Howard agonisingly losing out 30-31 in both games. With this cushion, Sputniks gained in confidence and although Howard and Michael added another point, Clyde took to the table at 7-9 down knowing that he had to win all three remaining games if the trophy was to come back over the Tay. Clyde started strongly and was catching Dave when the man from Broughty abandoned his usual careful tactics. Speeding up the play proved the nail in the coffin for Prefects’ hopes and Sputniks took the honours with a 10-7 victory. On the last Monday of the season, thirteen players gathered in the Victory Memorial Hall to contest the annual hard bat (ping pong) challenge. With play a little tentative at the start while everyone got accustomed to playing without spin, the rallies eventually became more adventurous over the evening. From the first round of play, Ian Brumwell, Graham Wood, Ian Smith and Howard Lee emerged as winners to contest a four-player group final format and by this stage some of the hitting and retrieving had become awesome. Scores were very tight, with no clear winner emerging – Howard beat Ian S but lost to Graham, who in turn lost to Ian B and then Ian S beat Ian B. As the last match of the evening was poised to start, the possible permutations of outcomes were putting the previous night’s Masters play-off in Augusta in the shade – and Graham and Ian S did not disappoint with some spectacularly long rallies. In the end, Graham’s steady play just edged Ian out of the running but left himself and Howard tied on two wins from three outings. As Graham had overcome Howard in their head to head, it’s the former’s name which will be engraved on the Celebrate Legacy Shield, but it really could not have been more closely contested. And so to a spring and summer of practice for all the table tennis enthusiasts. The Rascals gang of beginners and returners will continue to play at Madras College, Kilrymont on Thursdays between 6.00pm and 8.00pm while the league players will meet on Mondays at the Victory Memorial Hall where Michael Hahn will pass on his skills to his club-mates in a series of coaching sessions. This entry was posted in Match reports, St Andrews Table Tennis Club on April 13, 2017 by standrewstt. to another sizzling table tennis tournament somewhere between Dubai and Southampton. 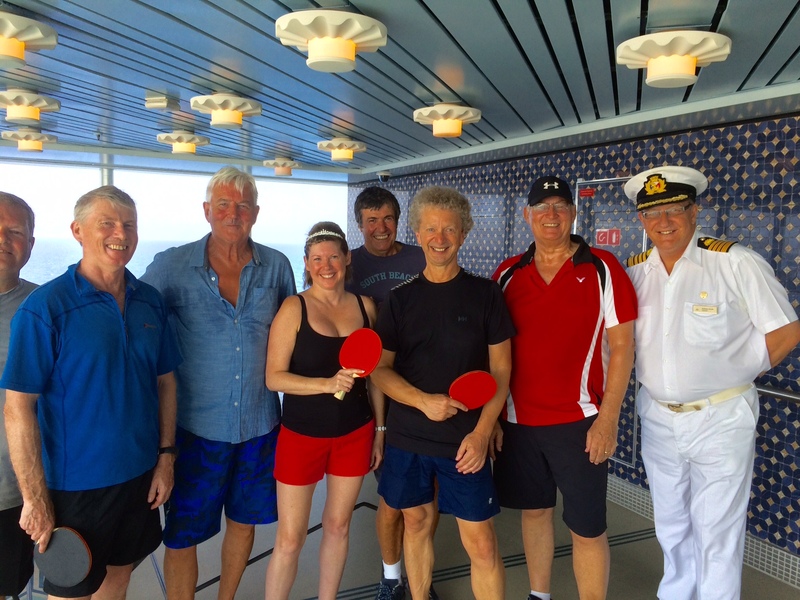 The club has greatly missed Sandy during his annual world cruise. This entry was posted in St Andrews Table Tennis Club on April 5, 2017 by standrewstt. The last week of fixtures in the Dundee & District League brought mixed feelings to the five teams representing St Andrews Table Tennis Club. In Division One, Prefects’ season rather fizzled out when opponents Earls conceded the match, but Howard Lee, Michael Hahn and Clyde Johnson will line up one more time in the season when they face Sputniks in the Handicap Cup final. Prospects travelled to Broughty Ferry for their final fixture against Comets and achieved a respectable 3-7 score-line against the second placed team. Pleasingly, Jon Fraser, Dave Goddard and Neil Lea all shared in the three wins. And so to the nail-biting conclusion to Division Two. Sitting in the top half of the table, Truants faced Kingsway with the dual task of achieving enough points to secure a third place finish, and of inflicting a telling defeat on their opponents, to help clubmates New Kids and Swots in their relegation battle. Sascha Roschy, Graham Wood and Knut Radmer rolled their sleeves up to battle to a 7-3 victory – just enough to give them the third spot in the division by a one game margin over Chieftains, but would it be enough for Swots and New Kids? The previous evening, Ian Smith had found his best form of the season in winning his three singles against Rollercoasters and the doubles with Ken Falconer to bag four valuable points for the Kids. Kingsway’s three points against Truants meant that, at the end of twenty fixtures, the two teams were both locked on 58 points. In this situation, league rules put the team with the better head-to-head results into the higher position, giving New Kids the nod to be placed above Kingsway in the final table. Finally, Swots took to the table against second placed Thumpers at Forthill on Thursday evening sitting on 57 points, knowing that a single victory would take them above both New Kids and Kingsway on the count-back ruling. Agonisingly, that win could not be manufactured despite the blood, sweat and tears of Dave Beveridge, Emma Bissett and Collin Bleak and the 10-0 thrashing meant that Swots finished the season propping up the rest of the teams. The sombre car chat on the journey home was of how different it would all have been if any one them had converted just one more match point out of the many contested earlier in the season. 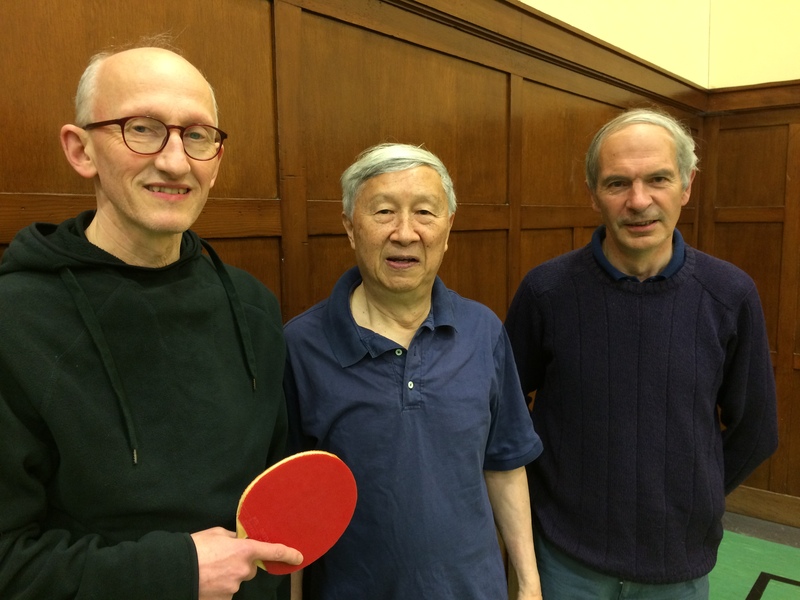 This entry was posted in Match reports, St Andrews Table Tennis Club on April 1, 2017 by standrewstt.